Does AGN feedback trigger star formation? Active Galactic Nuclei (AGN), regions of extremely high luminosity at the centers of some galaxies, are thought to radiate due to accretion onto a supermassive black hole. This emitted radiation, or feedback, sends energy into its environment and influences the evolution of the host galaxy. The details of this feedback are not well understood. We do, however, observe several relationships between properties of the host galaxy and the central black hole — the most prominent of which is the M-sigma relation. This empirical correlation states that the black hole mass (M) scales as the fourth power of the velocity dispersion (sigma) of stars in the galactic bulge. Clearly, there is some connection between the evolution of the black hole and that of its host galaxy. A basic model for AGN feedback states that when the central black hole reaches a certain critical mass, feedback blows out material from the bulge, preventing more accretion. Therefore, black hole growth is self-regulated through negative feedback. This paper explores a possible secondary effect: could feedback trigger star formation, and thus contribute to the growth of the host galaxy? Radiation pressure due to photons generated by the AGN impinging on dust embedded in gas is here considered the primary relevant AGN feedback mechanism. To model the feedback, the authors consider a shell of dusty gas swept outwards by radiation pressure and check whether this pressure could deliver energy to a large part of the galaxy. The interaction consists of dust grains absorbing the radiation from the AGN and transferring the momentum to the gas. Under some basic assumptions about how the dust and gas interact with each other and light,, radiation pressure is found to be a viable process for driving gas out to large radii. Before determining how AGN feedback can influence star formation, it is first necessary to see what happens to the dust shell over time. Does it escape the galactic halo, stay still, or move around in strange ways? Given a dark matter density profile, it is possible to write out an equation of motion for the shell’s radius as a function of time and AGN luminosity. The paper tests three well-known density profiles: the isothermal sphere, the Hernquist profile, and the NFW profile. Figure 1: Radial evolution of a dusty gas shell in the isothermal sphere. The black and blue lines are for luminosities lower than the critical luminosity, while the green line is for a higher luminosity. Notice that the first two eventually collapse, while the third can expand. Figure 2: Velocity evolution of a dusty gas shell in the NFW profile (the Hernquist profile is very similar). The black line is the velocity for a standard central luminosity, while the blue line indicates the escape velocity at that radius. In the case of the isothermal sphere, there is a critical luminosity that determines whether the shell expands outwards or collapses back upon itself. If the luminosity is greater than this value, at large radii the shell always reaches a constant velocity, depending only on the luminosity. 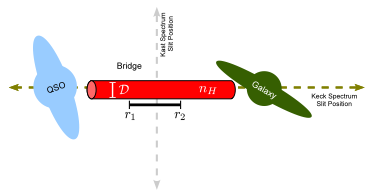 In addition, when comparing to the M-sigma relation, it is found that for a shell to completely escape the host galaxy, the black hole mass must exceed 3 times the normal mass implied by the relation. The results for the Hernquist and NFW profiles are quite similar to each other. Again, there is a critical luminosity below which shells cannot reach large radii. 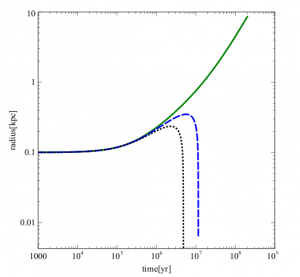 For luminosities exceeding the critical value, the shell velocity reaches a minimum but eventually rises again and exceeds the local escape velocity at large radii. 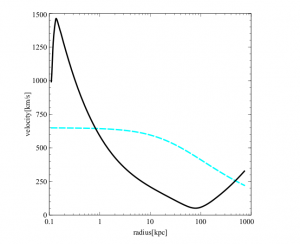 But what do these velocity curves mean for star formation? 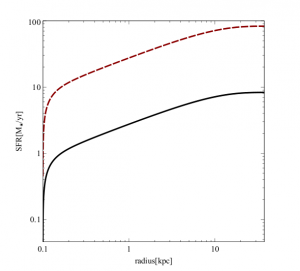 Figure 3: Star formation rate as a function of radius for the Hernquist profile. The two curves indicate different star formation efficiencies: black is 1% efficient while red is 10% efficient. The SFR is constant at large radii. Finally, the authors parametrize the star formation rate (SFR) as scaling with the inverse of the “local flow time,” which at any location is the radius divided by the shell’s velocity. The SFR scales directly with the shell velocity; the faster the shell moves out, the more stars are born. This can be interpreted as a squeezing and compression of the cold gas induced by the shell moving through, which could cause local density fluctuations leading to star formation. For the isothermal sphere, the SFR is constant at large radii, on the order of 10-100 solar masses per year for typical galaxy parameters. Once stars form, they decouple from the expanding shell and remain bound to the galaxy as long as the shell’s speed was below the escape velocity at that point. This means that in the regions below the blue curve in Figure 2, star formation increases the host’s stellar mass. Taking into account an entire feedback lifetime, a total of about 10^9 solar masses are added in 5 x 10^7 years, which is relatively consistent across all three profiles. The total mass, of course, remains constant. AGN feedback is often invoked to suppress star formation. This study, though, shows that the opposite may actually be true. To lend credence to the theory, recent observations have shown that from redshift of about 2 to the present, the total stellar mass of galaxies roughly doubles; however, the increase takes place mainly at outer radii while stellar mass in the central regions remains roughly constant. This model of star formation is qualitatively consistent with this inside-out growth mechanism. I am a third-year graduate student in the Astronomy Department at Harvard University, and am interested in cosmology and instrumentation for radio telescopes. I work with John Kovac on several telescopes at the South Pole designed to detect the signature of inflation in the cosmic microwave background. In 2011, I graduated from Caltech with a degree in physics. I worked with Tony Readhead to build a Ku-Band polarimeter for the 40-Meter telescope at the Owens Valley Radio Observatory, and with John Johnson on M Dwarf Metallicities. 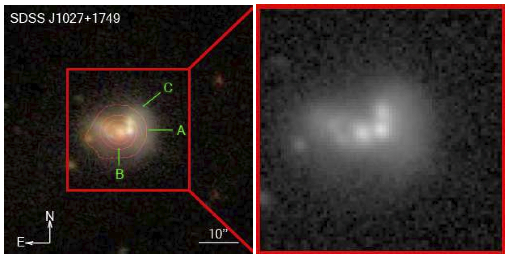 We have shown last year that for “coevolution” signatures as the M_BH-M_bulge relation one does not need any feedback, but that correlation between galaxy or its bulge (mass, luminosity, number of globular clusters, whatever) and the black hole mass arise automatically by the hierarchical buildup of galaxies. Central limit theorem meets buildup of mass functions. Hence yes, one can construct many, many more or less ad hoc feedback mechanisms, any some will have effects on either partner, but the scaling relations are NOT the crown witnesses of any feedback at work. If “feedback” from an AGN were to trigger star formation, we should see young, just ignited quasars, where the AGN phase precedes the peak of the star formation. Yet in observations we see the exact opposite, the bulk of the star formation burst ignites before the accretion of the black hole is seen. In Spitzer+HST observations of young, highly accreting, dust-reddened, luminous quasars, we have found the quasars to lie significantly below the M/L relation. Furthermore the star formation rates, while not spectacular, were in the LIRG (10-100 M_solar/yr). The bulk of star formation precedes the main quasar phase. Furthermore, we have (at least statistical) evidence, that the stronger the wind, the less the system is likely to be dominated by star formation, but rather AGN dominated. This sort of anti-correlation is indicative of the wind quenching the star formation rather than actually triggering it.